Summer is coming to an end, but there are definitely a few more choice weekends to try to get outdoors. Viennese fall promises Sturm (lightly fermented wine) and pumpkin and there are still moments to enjoy the mature wines. 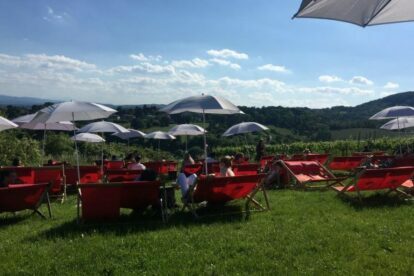 And while there are countless vineyards and heurigen in the outskirts of Vienna, none are with quite the relaxed & refined vibe of Mayer am Nussberg on the border of the 19th district, high up on Kahlenbergstrasse. This small wooden hut is situated in the middle of the vineyard and has no indoor seating. However, the grass field surrounding the hut is full of tables, benches, cots, and couches. The view of Vienna is slightly obstructed (and can be seen in its full glory just 100m up the road), but still jaw-dropping on a clear day. What’s more, the Kahlenberg and Leopoldsberg abbey are directly in view on the hill above (and can be reached with an intrepid and somewhat steep 20 minute walk). The wine is, of course, local and the snacks are excellent. The clientele is swanky, but open and friendly. The beautiful people mingle with the families over a local Grüner Veltliner and charcuterie. Getting there is not that simple (via public transportation, there is still a decent walk uphill), so a car would be useful and can be reached from the city center in 10 minutes. It is however well worth the effort and a classier afternoon anywhere in Vienna would be hard to be had.